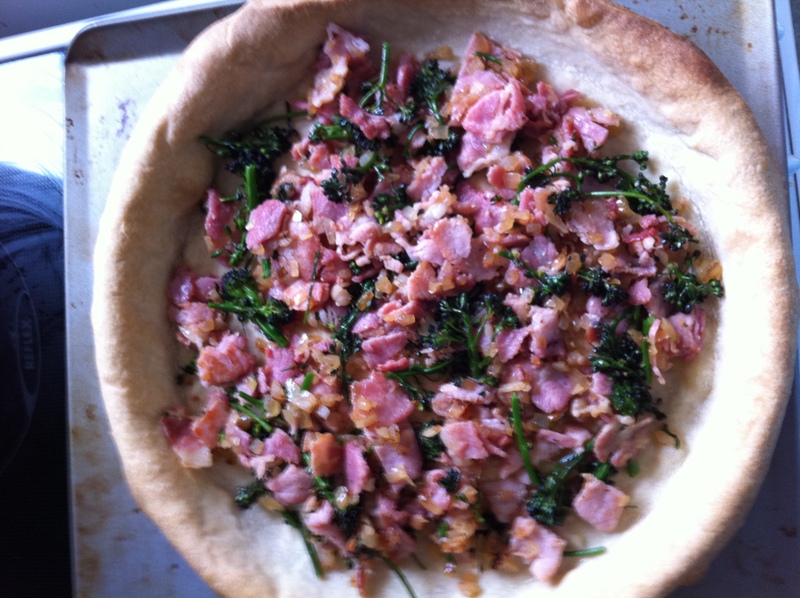 EASY BACON & BROCCOLI QUICHE | YUM YUM PIGGY'S BUM...! Apologies for me being away so long from blogging. Been trapped and frustrated trying to sort out my career and wondering whether or not if I was gonna stay employed or end up on the dole. Luckily I’ve managed to at least get 2 part-time jobs to earn some cash to keep going, phew! On top of that, my camera didn’t work anymore so I’ve had to rely on a new phone camera courtesy of Apple (!) to take some new foodie pictures. Right this month, couldn’t help but notice blazing glorious sunshine in Britain, sunbathers basking on beaches and parks packed full of kids and adults enjoying and making the most of the warm weather. Thought it would be appropriate to post something on picnic type food which can be made well in advance and eaten cold. How about quiche? Fairly simple to make, especially if you purchase ready made shortcrust pastry, very adaptable in terms of what meat and vegetables you want to add. 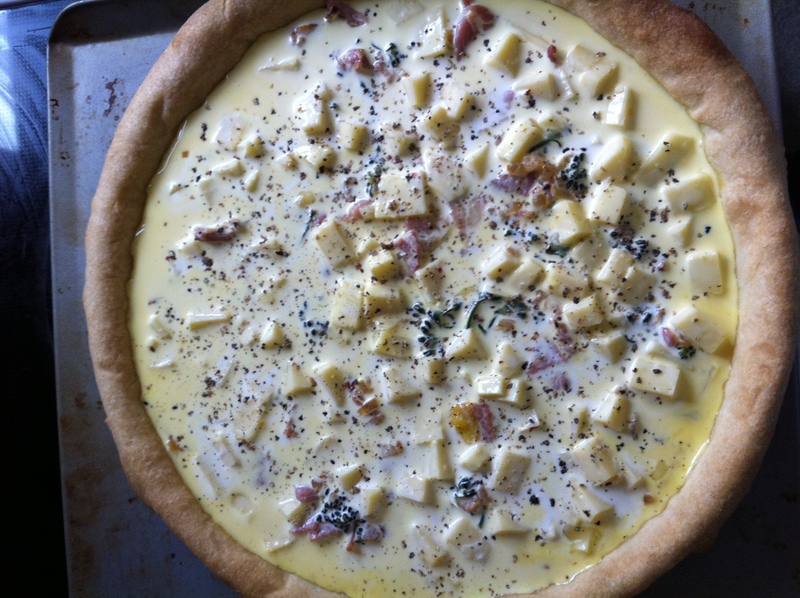 It’s like an open pie for those of you who are not familar with quiche. It’s very popular in England as well as France where it is a classic dish and it’s basically a pie crust filled with an egg and cream or milk mixture with vegetables and/or meat plus cheese. 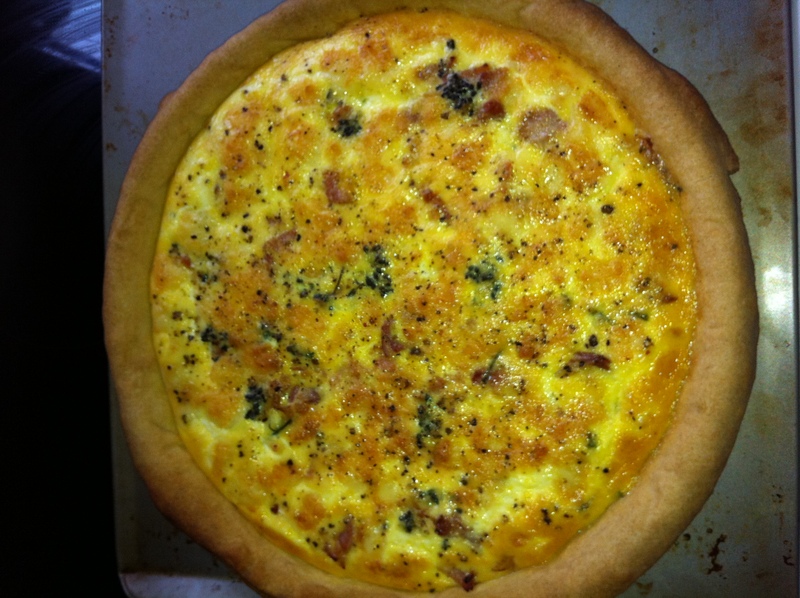 A typical quiche is quiche Lorraine which contains smoked bacon and cheese in an egg and cream mixture. After rolling out the pastry and lining the flan tin, leave in the fridge for 30 min to chill. Otherwise the butter in the pastry will start to melt before the pastry has cooked and can cause shrinkage! So fresh and beautiful to look at! 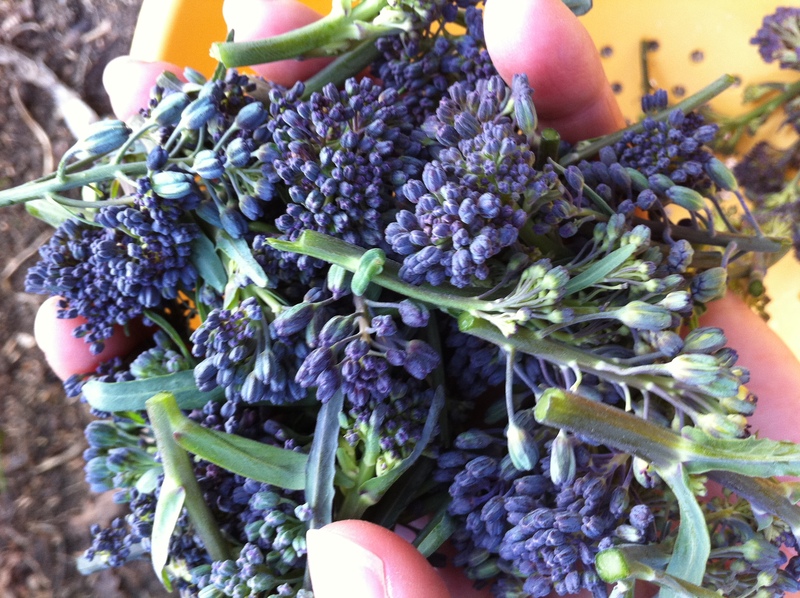 I managed to harvest my purple sprouting broccoli from my garden before they flowered and they looked blooming gorgeous. Well worth the effort of growing them as they’re pretty expensive at the supermarket. Bacon and broccoli are a good combination plus broccoli is good for you to eat as it’s rich in vitamins A and C, iron and cancer fighting compounds to help keep your body in tip top condition. Was so chuffed to make my own quiche as I declared it a million times better than a premade one from a supermarket. At least I know what ingredients I’m adding and I can use leftover bits of ham and different cheeses and bits of vegetables such as red pepper and spinach for variety. Making this quiche is a sure-fire winner, try it and taste it for yourself! Sprinkle flour on your work surface and on your rolling pin. Roll out the pastry to form a circle that is larger than the size of your flan tin. The thickness should be about 0.5cm. Place the pastry over your rolling pin, lift up and move the rolling pin over the tin to carefully line the tin and gently press the pastry in the fluted sides and bottom. Trim excess pastry hanging over the edge of the tin and leave about 0.5 cm pastry overhang just in case there is any shrinkage. Cover with clingfilm and leave in the fridge for 30 min. Preheat oven to 200 deg C/gas mark 6. Remove the tin from the fridge, remove clingfilm and use a fork to prick about 8-10 times all over the base . Cut a piece of baking parchment paper that is large enough to line the tin and scrunch up before lining the tin. Fill with baking beans, ensuring they are at the edges of the tin, place tin on a baking tray and bake “blind” for about 15 min until pastry is golden and crisp. Remove tin from oven and carefully lift out the baking paper with the baking beans and set aside (careful they are hot!). Return the tin to the oven and bake for a further 5 min until the base is golden coloured. Take tin out and leave aside on the baking tray. Lower oven temperature to 150 deg C/gas mark 2. Meanwhile fry the bacon for a few minutes, add the onion, cook until softened and then add the broccoli and fry for 2 min. Add bacon, onion and broccoli mixture to the bottom of the pastry case. Add the cubed cheese to the pastry case ensuring it is evenly distributed. Combine the beaten eggs and cream and mix in a measuring jug. Pour carefully over the pastry case. Season with black pepper, no salt required as there’s a sufficient amount from the bacon. 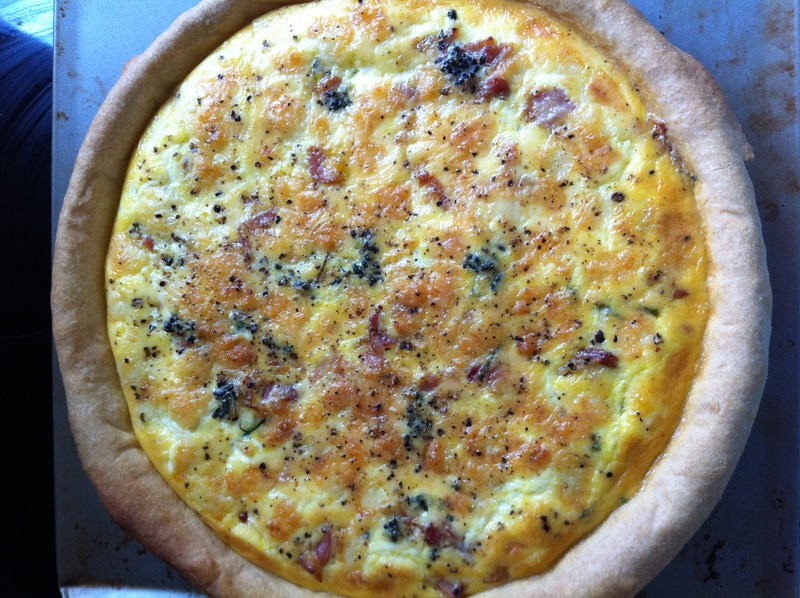 Bake the quiche for 30-35 min until golden on top and the filling is firm. Leave for about 10 min before serving. Can be left to cool to eat later. A homemade and tasty quiche fresh from the oven!